The ERM was a semi-fixed exchange rate mechanism. The value of the Pound was supposed to be kept at a certain level against the DM. £1 = DM2.95. The lower limit for the exchange rate was DM 2.773. If the Pound approached this level, the government would be obliged to intervene - through buying Pounds and raising interest rates. Enable countries to join the single currency - the Euro. In the late 1980s, the chancellor, Nigel Lawson was keen to join the ERM. But, Mrs Thatcher with her more euro-sceptic views wanted to stay out. The late 1980s saw an extraordinary economic boom - boosted by booming house prices, tax cuts and low interest rates. Growth reached record levels of 4-5% a year. Enthusiastic government ministers talked of an economic miracle - hoping Government policies had enabled, at long last, to catch up with other countries like Germany. However, this miracle was an illusion. High growth was unsustainable and led to inflation. 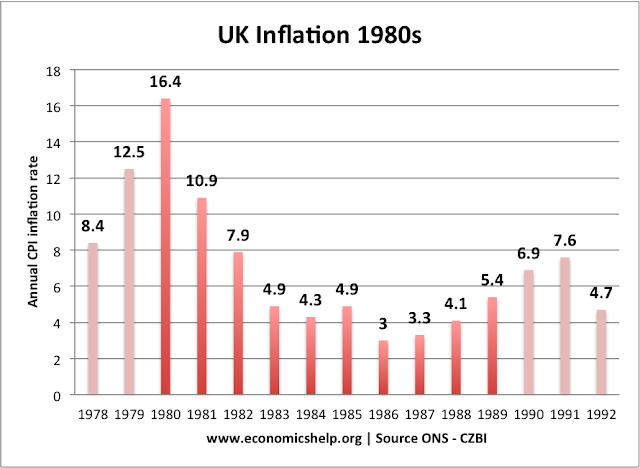 (see: Lawson Boom) With inflation of 10%, Nigel Lawson was able to convince Mrs Thatcher that the UK would benefit from joining the ERM to help reduce inflation. 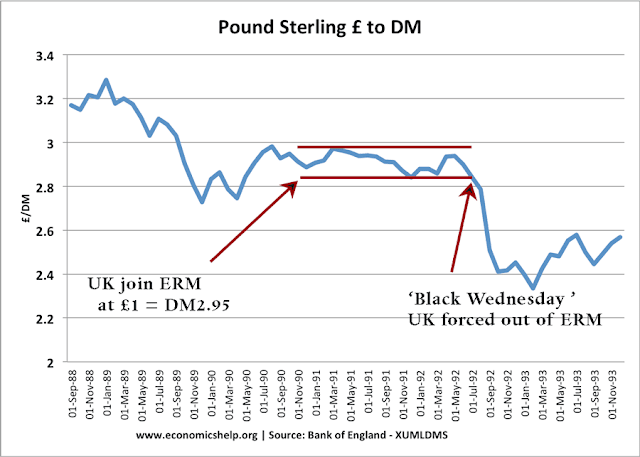 Therefore, the UK joined in October 1990. at a rate of DM 2.95 to the Pound. 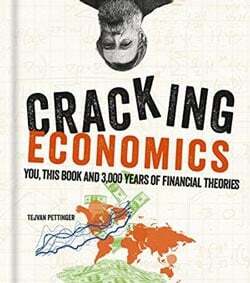 However, the problem was that the economic situation was declining quickly. 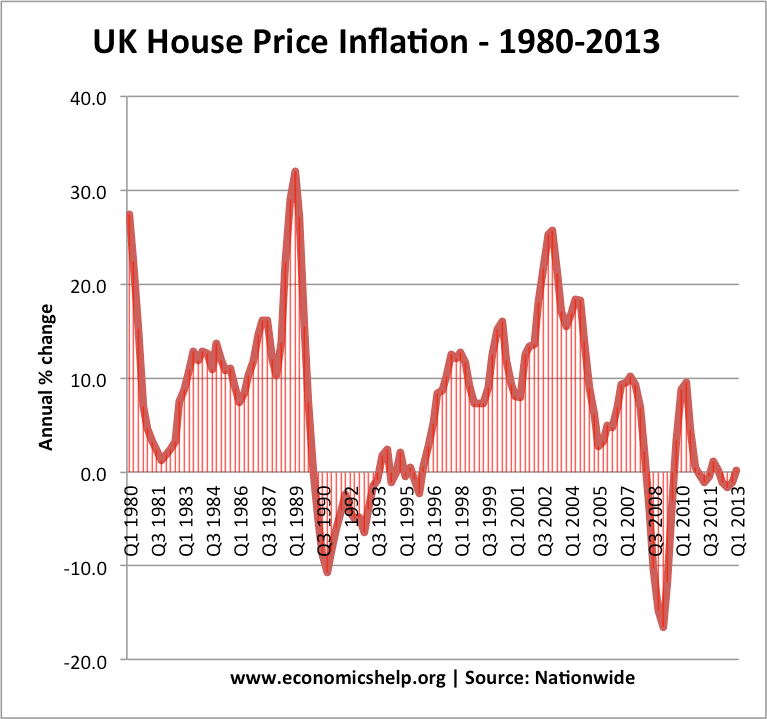 The UK was sliding into recession due to falling house prices and an end to the past economic boom. 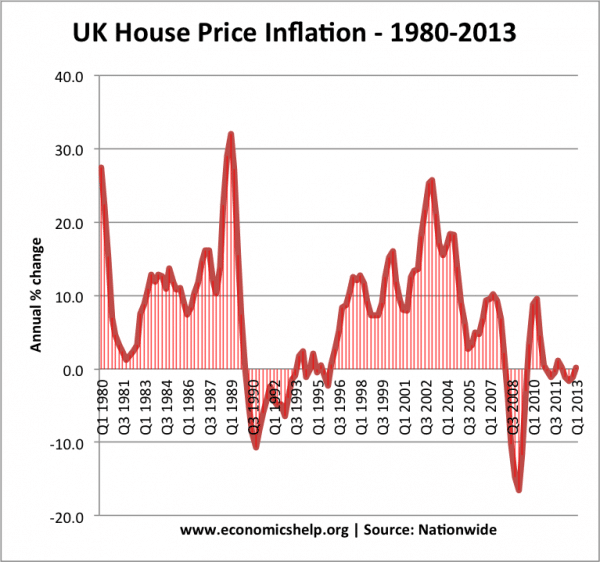 Increasing interest rates - this attracts hot money flows - it is more attractive to save in UK with high interest rates. Buying pounds with foreign exchange reserves. 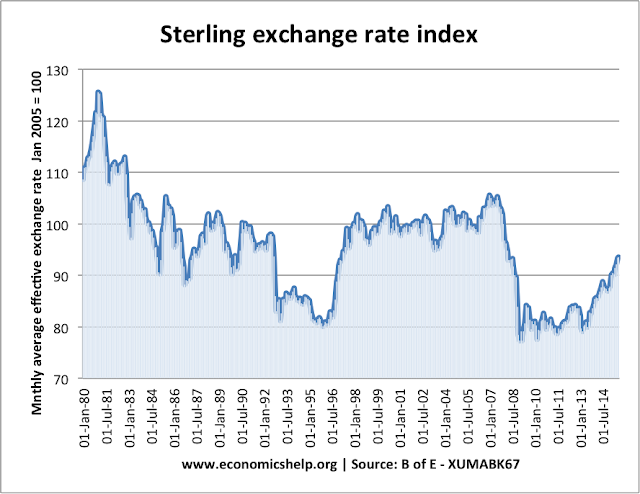 However, these policies of protecting the value of the Pound was causing a serious economic downturn. High interest rates particularly hit the housing market. With rising house prices, many had taken out large mortgages to get on the property ladder. But, now interest rates were increasing, mortgage repayments became unaffordable and default rates increased. Combined with rising unemployment from the recession, the housing market saw a dramatic fall in prices that was to last 4 years. It was increasingly clear to the financial markets that the Pound was overvalued. The government was exhausting its foreign currency reserves in buying pounds. But, more problematically, the high interest rates was causing a serious recession and misery for homeowners. It became a question of pride for Ministers, with Norman Lamont and John Major pledging to keep the UK in the ERM, seemingly at all costs. For a long time, the British government fought a losing battle. But, the foreign currency reserves of the British government were no match for the trillions of Pound Sterling traded on the foreign currency and the pound kept sliding. It is estimated that the Treasury used £27 billion of foreign currency reserves trying to prop up the Pound. The Treasury estimated the final cost to the taxpayer was estimated at £3.4 billion. 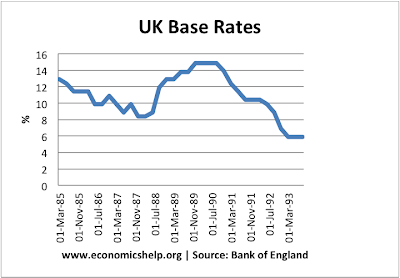 On one desperate day - Wednesday 16th September, the UK government increased interest rates to 15%. In theory, these high interest rates should attract hot money flows. But, the market saw it for what it was - a measure of desperation. The market knew these interest rates were unsustainable and couldn't be maintained; the sell off continued and eventually, the government caved into the inevitable and left the ERM. The Pound fell 15%, interest rates were cut, and the economy was able to recover. It is a classic example, of failed government policy. 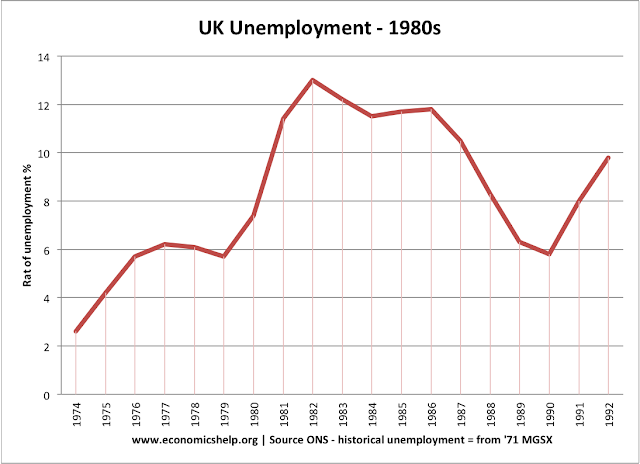 If the UK had joined the ERM at the start of the economic boom in the mid 1980s, the anti inflationary impact would have helped moderate the boom, kept inflation low and prevented a painful readjustment. But, they joined at the wrong rate at the wrong time. Trying to keep the Pound artificially high caused a recession, deeper than any of our competitors. The ERM was dubbed 'The eternal recession mechanism'. The artificially high exchange rate just attracted financial speculators who saw the British government as a source of easy profit. 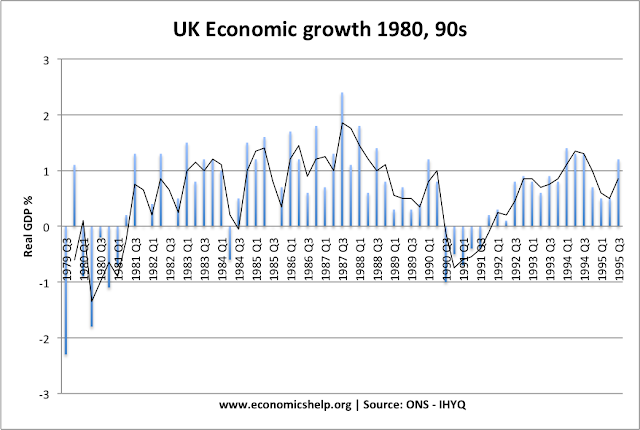 On leaving the ERM, the UK economy soon recovered. This was partly due to devaluation, but also perhaps more importantly - interest rates were able to fall significantly. However, the episode left painful scars and played a key role in keeping the UK out of the Euro. It also shows the mistake of targeting inflation through an intermediary such as the exchange rate. As a consequence of this episode, the government gave the Bank a direct inflation target of 2.5%. The ERM crisis also paved the way to given the Bank of England independence in 1997. The hope was that an independent bank would avoid the excesses of the Lawson boom and bust of the 1980s. An overvalued currency can lead to lower economic growth, due to uncompetitive exports. Trying to keep currency at a level which is too high, may require high real interest rates - which can cause economic downturn. It is hard to buck the market. Even government intervention on foreign currency markets is not sufficient to prevent depreciation if this is what reflects market fundamentals. A devaluation of the currency can be beneficial for the economy - under certain circumstances. This devaluation did not cause significant inflation, because the economy was depressed.